When digital music assailed the music labels, their first response was to sue teenagers for peer-to-peer file sharing and to hire technologists to write Digital Rights Management software. DVDs bought in Asia wouldn't play in American DVD players, and so on. For finance, as blockchain nips at the ankles of storied industry, much of the response has been to (a) bring sovereign power to bear on the misfits, chasing them around to jurisdictions like Bermuda and Malta, and (b) hire technologists to build up enterprise control of crypto assets for issuance and trading. Symptoms of this abound -- from London Stock Exchange putting $20 million into Nivaura, to Swiss private bank Julius Baer entering the space, to regulators of various risk-tolerance drawing lines in the sand around token activities. This is all good progress, we think, but it is an intermediate step to the Spotify (or Google or Netflix) of finance. Let us dwell on a distinction for a moment. Fintech players democratized access to financial products -- see our many earlier entries on amassing consumers through attention platforms at discounted prices. Those financial products, however, are still institutionally manufactured. But when you look at music or film today, an increasingly large portion of our attention is going to creator-generated content that sits on Youtube and Twitch. We all watch Game of Thrones (i.e., made by the Goldman Sachs of content production), but we also see Gary Vaynerchuk and Joe Rogan endlessly peddling their hustle -- without traditional institutional backing. The same point can be made about Uber drivers. Decentralized finance is the latest iteration of the crypto theme, and its core premise is that the manufacturing of financial products across the whole stack will be done by individual creators, or aggregated to scale via crowd cooperation driven by DAO governance like Aragon. For the more traditional readers of this newsletter, these words sound like nonsense, but they are not. Payments is the simplest use-case, and already has a decentralized product that works to this day: Bitcoin. 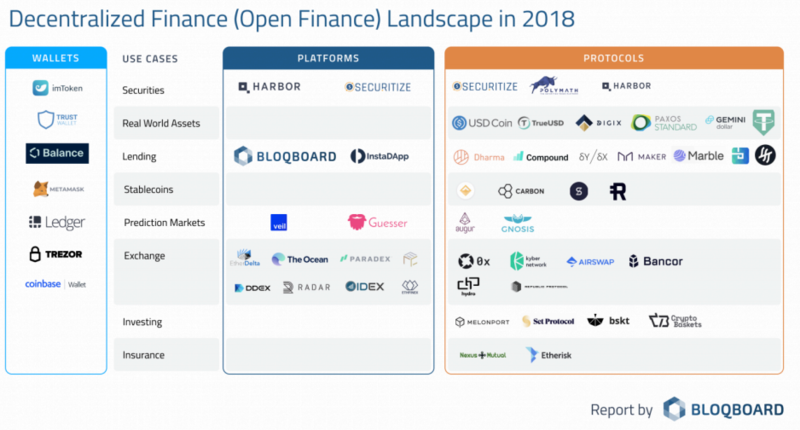 Lending, Trading, and Derivatives -- intermediated by software networks and not by legal issuers -- are starting to come online. 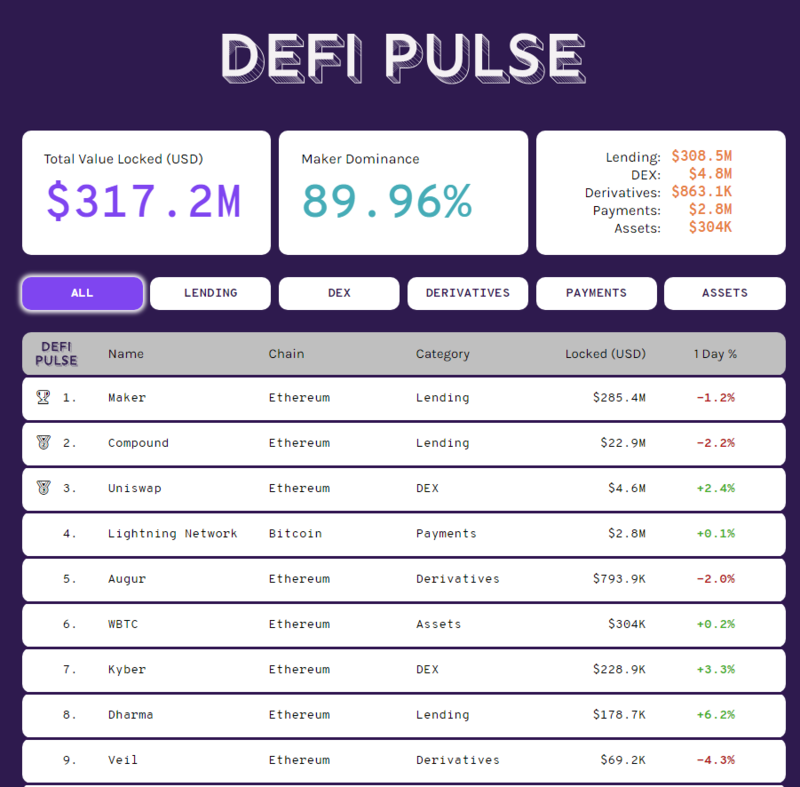 The tracker below shows some of the smaller independent projects, the maturity of which reminds us of Ethereum's dApp tracker in early 2017. The other reading we encourage you to do is check out Multicoin Capital's report on crypto exchange Binance, its BNB token, and decentralization plans. Facebook and Amazon, companies whose value has been built over 20 years, are locked into a public shareholder structure that will disallow them from burning down the house and giving all the value away to users. Not so for a multi-billion dollar phenomenon built in a few years, where the largest existential danger is legal sanction to the billionaire founders for unregistered securities dealing. Atomizing the economic value of a quickly-built monopoly into software running on millions of computers, such that it cannot be shut down or controlled (e.g., Pirate Bay), could be the chassis of real, at-scale decentralized finance. Right now though, this theme is struggling to get off-the-ground with meaningful volumes, so a heroic event will be necessary to properly kick things off.